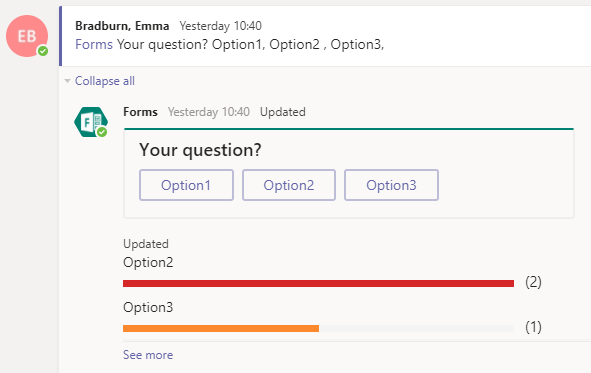 Within Microsoft Teams you can easily add a real time poll to the conversation area by mentioning Microsoft Forms. Great for instantly gaining quick feedback from your students. Polls can also be created on the go through the iPad app. All you need to do to is @ mention Forms in your Team conversation area, ask a question and then type in the response options. Within seconds your poll will be available to the Team members. A Quick Poll Form can have up to six options and one response per person. Open a Team and select the Channel you want to poll. This will open the Conversations area. Type a new message and type @Forms select the Forms icon when it appears. This instructs the Forms bot that you want to create a poll. Within the same message immediately after @Forms start typing your question. Add a question mark after it, Forms won’t recognise the question if you don’t. Now type between two and six answer options with a comma between each. When you are ready to poll, send the message by clicking on the blue arrow. Within a few seconds it will be available to the whole Team to respond by selecting one of the options. Teams will display the responses in numerous ways depending upon the platform you view them on. All the summary responses are anonymous if you want to see individuals selections you will need to open the responses in Excel, more about this later. Currently on the iPad Teams app the responses appear under the form, with the number of selections next to each option. The web and desktop version of Teams will display responses in a bar graph. You can also go to https://forms.office.com open the Group forms tab and search for your Team. Within Forms you can view the form responses in a pie chart and Open in Excel (on the desktop) where you can see personal responses. If you have any questions about any of the above, please feel free to drop the Digital Learning Team an email at elearning@tees.ac.uk. Clicking here will take you to a page where you can find out more about our support including Masterclasses and Coaching Sessions.